Joel's Jottings: Free Speech or Sedition? In India, the arrest of cartoonist Aseem Trivedi under section 124-A of the Indian Penal Code , for sedition, has triggered once again, a debate on Free Speech; and whether the Sedition Law is really draconian and outdated. The cartoonist was arrested on charges of mocking the Constitution, the Parliament and the National flag through his cartoons. And, now, though he is released on bail on September 12 with promises that charges will be dropped, the issue of ‘freedom of expression’ is once again at the forefront. I have seen the controversial cartoons of Aseem Trivedi and, personally, I found them very tasteless and very coarse. But, he seems to have somehow driven home his point strong enough for the government to wake up and arrest him. Only an international public outcry from far and wide, including from ‘Reporters without Borders’ and ‘Amnesty International’, has made the government release him. We can examine this issue from two angles; Firstly, on the law on which he was arrested and secondly, on the cartoons he drew. Indian Penal Code was written during the British Raj. It was drafted in 1860 and came into force in 1862. Earlier to that, the Mughal ‘Sharia’ law was largely applicable, with Hindu Law being given precedence by courts depending on which princely state it was in, and depending on who the subjects on trial were. The section states that “Whoever, by words, either spoken or written, or by signs, or by visible representation, or otherwise, brings or attempts to bring into hatred or contempt, or excites or attempts to excite disaffection towards the Government established by law in India shall be punished with imprisonment for life, to which fine may be added, or with imprisonment which may extend to three years, to which fine may be added, or with fine”. This law was perhaps needed when public awareness was less, and when respect towards the government was, in effect, a demand by the government. Obedience without questions was perhaps necessary, at times, in the interest of national security. But, today, however, I wonder if the body politic needs any protection. Thanks to technology, the growth of social and mass media has been phenomenal. And governments cannot underestimate people’s awareness levels, and their desire to express themselves in a way they see fit. Which is why, India’s People’s Union of Civil Liberties (PUCL) in its statement had said that Aseem Trivedi’s arrest is: “an attack on the freedom of speech and expression granted under the Constitution of India. Merely expressing one’s views against the corrupt politicians, bureaucrats and corporate through any medium of one’s choice does not in any way constitute sedition”. This brings me to my second point, on whether Aseem Trivedi’s cartoons were really seditious or not, and I feel that one must think before they decide. Let me paint a picture of at least four of the cartoons for which the cartoonist was put in the locker. In one cartoon, he drew Ajmal Kasab - the only terrorist caught alive during Mumbai Terror attacks - as a dog urinating on a book titled Indian Constitution (It is somewhat ironic that it is the same constitution that the cartoonist’s supporters say gives the cartoonist, the right to freedom of expression)! 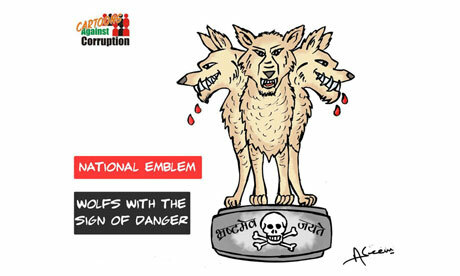 In a second cartoon, instead of the three lions of India's Ashoka symbol, the national emblem, he used three bloody-jawed wolves. And the usual legend under the symbol Satyamev Jayate, translated as "truth alone triumphs" was replaced byBhrastamev Jayate which means "corruption alone triumphs." 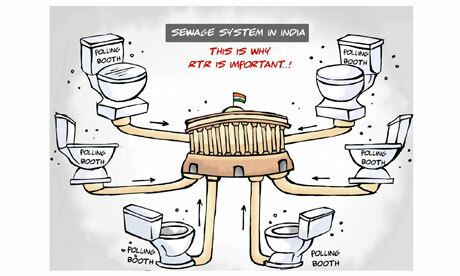 In a third cartoon he drew six toilet commodes (with 'polling booths' written on each) connected by pipes to the Indian parliament building; telling viewers what, or who, is being flushed into the parliamentary building from across the country. In a fourth cartoon, the Indian parliament building or the ‘Sansad Bhavan’ in New Delhi, is drawn, as a toilet bowl, with flies hovering above. Though somewhat rude and offensive, they seem to have very effectively portrayed and mirrored the frustration of the masses in the aftermath of the recent corruption scandals that rocked the nation. We know that a political cartoonists’ job is to do just that. And, as can be seen from the support he received, many people seem to agree with the cartoonist. Making fun of the constitution, even in pictures, is obviously not very agreeable. But calling the act downright criminal and calling it seditious is definitely carrying it too far. It is making a mountain out of a mole hill. And, any law, of imprisonment for life, or for three years, for these types of drawings is definitely draconian. A government which wants Washington Post to accept an angry note (written in response to Post’s article calling Indian Prime Minister inefficient), must be willing to accept an angry cartoon from those who disagree. Tolerance is a difficult virtue. But, it is a good one to have. Times have changed. Exacting unquestionable obedience from faithful subjects is a thing of the past. While the writers and cartoonists must be self-censuring and responsible, I am sure the law needs a revisit. Governments too, should not misuse this law by its loose interpretation.